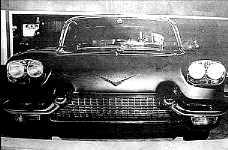 Harley Earl recalled in an interview that the first minutes of meetings concerning the Eldorado Brougham were recorded on May 4, 1954, and included preliminary specifications of the passenger compartment. 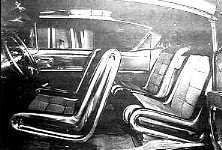 The four-passenger seating was tentatively agreed upon as well as general seating dimensions. 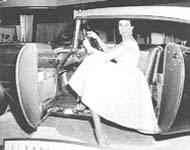 Shortly afterward the wheel base and treads were pegged and a seating buck was fabricated with seats, steering wheel, and foot controls installed in accordance with our full-size layouts. At the same time I gave approval to start immediately on a full-size clay model. 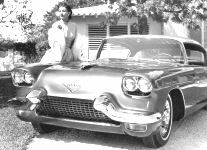 In the Eldorado Brougham dream car of 1955 were combined all the styling and mechanical characteristics that had been seen in earlier Cadillac dream cars [the Orleans, in 1953, and the Park Avenue, in 1954]. 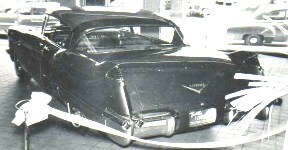 Ed Glowacke, then in charge of the Cadillac studio, had the clay model ready for show to management in August 1954. The sleek, low model was approved. 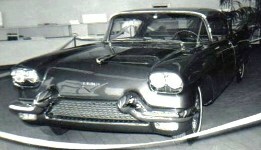 Work began immediately on the hand-built prototype that was to be displayed at the 1955 Motorama show just five months later. The car was painted on January 10, just nine days before the show was due to open in new York, a two-day trip away from Detroit. At 2 a.m. on January 19, just 14 hours before curtain-up, the Brougham was accidentally damaged, front and rear, when it collapsed from its transport dolly. Emergency repairs were hastily carried out. Fortunately, there were no visible traces of the mishap when, a few hours later, the public thronged around the car on its revolving stand at the show. Completely functional in every detail, the new 1955 Cadillac Eldorado Brougham is a luxury showcar exhibiting a wide departure from conventional automobile styling. Exterior features of this completely new car are: a wheel base of 124 inches, overall length of 209.6 inches, overall width of 77.5 inches and an overall height of 54.4 inches - or less than 4½ feet [sic]. Outside dimensions have been reduced without sacrificing comfort in any way. Easy access is gained to this four-door car, and the absence of center door pillars affords both driver and passengers virtually unobstructed vision through 360°. Styled in the mode of jet aircraft, the Eldorado Brougham has such features as fresh air intake on top of the front fenders, air outlets in the rear doors flush with the body panel, and dual headlight assemblies - outer lamps for the city and inner lamps for highway use - automatically controlled by an Autronic Eye. Capped by a brushed aluminum roof, the lower exterior of the car is finished in Chameleon green. Interior features match the modern exterior in every sense. The color of the interior is also Chameleon Green with top grain leather and imported French ripple silk is used as trim. The four individual seats are tailored to give the utmost in comfort and the driver's seat pivots outward, making entering and leaving the car almost automatic. The instrument panel, covered with shock absorbent material, is designed for the greatest possible visibility of controls. A storage compartment in the instrument panel and between the front seats serves the driver and front passengers. Located in front of the storage compartment between the seats is a courtesy light that also serves as a map light. 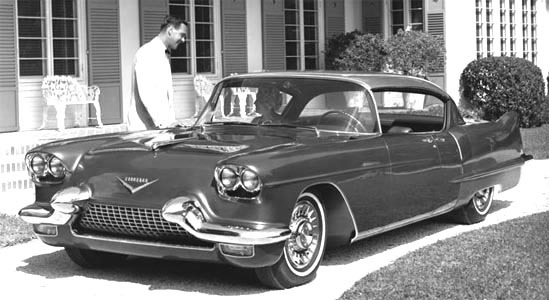 On a more practical plane, Cadillac has also introduced the Eldorado Brougham with an overall height of 54.4 inches and without a center door pillar ["B" pillar]. Fenders and characteristic tail lines are complimented [complemented?] by a tinted brushed aluminum roof. Dual headlight assemblies, Cadillac says, provide the most efficient road lighting yet devised. The outer lamps are flat beam city lights and the inner lamps are highly penetrating highway lights. Both sets are controlled by an Autronic-Eye mounted at top of windshield. Using new methods of construction, Cadillac has reduced all outside dimensions without sacrificing passenger comfort. All seats are individual and are tailored to fit the body. Wheel base is 124 inches, overall length is 209.6 inches and width is 77.5 inches. A highly iridiscent exterior color - Chameleon green - has been developed expressly for the Brougham and the interior is trimmed in matching paint, leather and imported French silk. The press release for the Boston venue of the Motorama, starting April 23, 1955 was worded slightly differently. It carried the reference O'Hk 5 11255. In September 1955, long after the brilliance and splendor of GM's Motorama for 1955 had waned, Motor Life carried a pictorial spread on the 1955 Eldorado Brougham prototype. 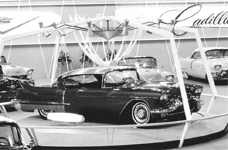 Under the heading The Eldorado Brougham - A NEW CADILLAC FOR 1956, the writer suggested that the class of super-luxury cars, neglected since the 1930's, was on the way back. He considered the Eldorado Brougham as certain to be a style-setter in advanced features. Twin headlights at the front end of each fender have five-inch lenses. Outer lamps are flat-beam city lights; inner lamps are for highway use. An Autronic Eye will switch from to the other as conditions on the road require. Interior includes padded instrument panel with recessed controls, Driver's seat pivots outward for easy entry and exit, while centre of both front and rear seats contains storage compartment. 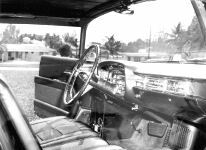 Note absence of small ventilator windows, considered unnecessary in a car having air conditioner and heater as integral unit. Quad exhaust is what Cadillac is calling the system that has dual pipes issuing from the rear fenders on each side of the car. This could be said to balance dual-dual headlights in front, but benefits in engine efficiency are unknown. Magnesium wheels simulate wire wheels [? ], but obviously will be easier to clean and polish. 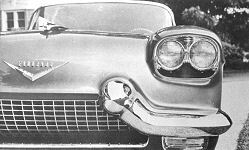 Front bumper has been a Cadillac trademark for several years. Top of Brougham, incidentally, is tinted aluminum, forecasting more widespread use of non-rusting metal in cars to come [no such luck!]. Rear doors open into the wind (...), a characteristic of four-door hardtops. But Cadillac engineers say they have developed an adequate safety device to forestall mishaps. Note triangular section that forms upper rear of door. Only chromed strip on side of body (right) is vertical trim, another Cadillac trademark in recent years, which may point the way to more restraint in exterior treatments for the future. Significant item: the Brougham's wheel base is 124 inches, five less than the current Cadillac 62 series. Are scaled-down cars coming from other U.S. auto manufacturers? As everyone knows, the answer to the last question was a definite "yes", although the industry had to wait a few more years before new compacts emerged en masse like the Corvair (by Chevrolet), the Comet (by Ford), the Dodge Dart and Plymouth Valiant (by Chrysler) ...and the "hottest" compact of them all, the Mustang (by Ford). More detailed was the report published by Modern Motor in September of the same year. Better than the best, proclaimed the headline. Cadillac said their new Eldorado would make people forget about the Rolls Royce. As Larry Foley, the columnist, pointed out, that was a tall order. 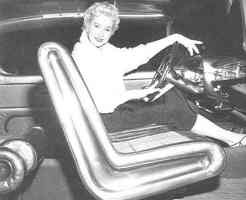 Illustrating the article was the well-known publicity shot of the rear of the Eldorado Brougham, taken during the Motorama tour in Miami, in which the Brougham was greatly enhanced by a lovely, platinum-blonde, Marilyn Monroe look-alike. Two leading United States car-makers have at last got round to considering the needs of their customers - the multi-millionaire. They believe it is high time he got a car worthy of his bankroll - an American equivalent of the Rolls Royce. 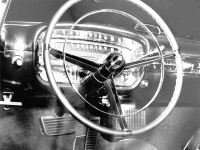 ...the Cadillac has become so common on the U.S. highways that the man at the wheel is no longer a man of distinction. Quite ordinary people drive Cadillacs. They may be poor, but they want to look rich. * The Lincoln Continental Mark II, being made by the Ford people. * The Eldorado Brougham, by Cadillac (General Motors). 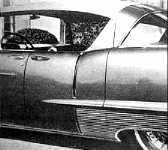 Of the two firms, the more vociferous so far have been Cadillac ...[they] have been much more characteristically American in their advance promotion of the Eldorado Brougham. 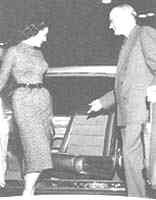 The Cadillac people announced, simply, that they were going into competition with Rolls-Royce of England. Their new luxury car, they said, "will make people forget about the Rolls Royce". Rolls-Royce of England, who might perhaps have been amused by such presumption, appeared not to hear. Judging by the description of the Eldorado Brougham, R.R. have nothing to fear from the proposed transatlantic competition. With its racy, low-slung lines (overall height only 4ft. 6in. ), four headlights, "quad" exhaust pipes, "projectile-shaped" rear bumpers and massive, flashy chrome-plating, the Eldorado Brougham is hardly likely to appeal to the gentry for whom Rolls-Royce of England have always catered - apparently to their mutual satisfaction, since R.R. have been going strong for 51 years and still need no more resounding form of advertising than their traditional, plain, modest little inserts in such journals as The Times: "The best car in the world". Nobody has ever gainsaid this claim - so you will either admire or smile at Cadillac for their brash prediction that their Eldorado Brougham will depose the Rolls. The true test of a car's value in the eyes of the world is the legends which form around it. On that score Cadillac lags far behind Rolls. ...It remains to be seen whether Cadillac, with their super-duper car, can match that something [which Rolls Royce was purported to have, in the story]. I doubt it. For one thing, the Eldorado Brougham won't even have a decent price-tag. The best they will be able to do, it seems, will be something around 10'000 dollars. Why, that won't even beat their American rivals, Ford, who are expected to charge around 12'000 for the Continental Mark II. With such low [!] prices, both will be far behind the Rolls, which costs 14'000 dollars - before the real work is put into it, like upholstery to match the linings of milady's furs, or hot and cold running water, or jeweled vanity-cases (3000 dollars alone), or gold-plated dashboards with diamond-studded clocks by Cartier, or twin folding-mirrors by Mappin and Webb of London, or concealed bars, or silver-plated bonnets [i.e. hoods], or costly fur lap-robes, or petit-point upholstery (all featured variously in the Rolls Royces of well-known contemporary Britons, Indian rajahs, and Americans). One comfort for the prospective buyers of these two new models: mass-production will not threaten the exclusiveness of their cars. Production of both will be limited - to 1000 a year for the Eldorado Brougham, and to about eight a day for the Continental [i.e. about 2000 a year]. ...Both are being produced in great secrecy, and neither maker has yet come out with pictures and details. 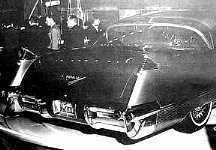 ...the Eldorado when unveiled is expected to be even less surprising because its prototype was featured, and got wide publicity, as a "dream car" at this year's Motorama, the annual road-show of General Motors. 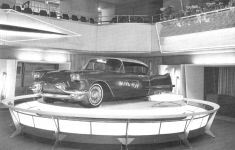 The dream car was in fact called the Eldorado Brougham, but the production model will be a modified version of the Motorama exhibit. One of the modifications will be the [absence of the] slinky blonde in a white evening gown [and the brunette in furs!] 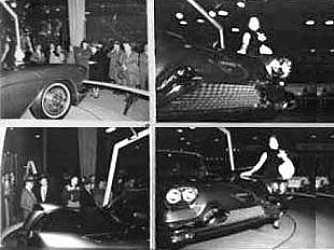 who appeared to be part of the Motorama model. 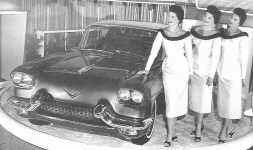 Discreet inquiries at Cadillac headquarters indicated that the blonde will not go with the production model [nor will the brunette]. That's too bad. I thought the blonde and brunette models were a unique feature on which the Cadillac boys really had poor old Rolls-Royce licked. Factory merchandising literature on this car includes a small, single card and a small 4-page folder; both pieces show the car painted black instead of the actual color used, which was called Chameleon Green (a shade of turquoise). More on the Eldorado Brougham Motorama model may be found in MT, 4/55 (front cover and pp.16-20), SSA 30th anniversary issue (pp.47-49), MC, Autumn 1974 (p.6) and ML, 9/55. Also I saw this car described in the French weekly Journal de l'Automobile as le cabriolet Eldorado avec son toit mobile en aluminium [the Eldorado convertible with its removable aluminum roof]!